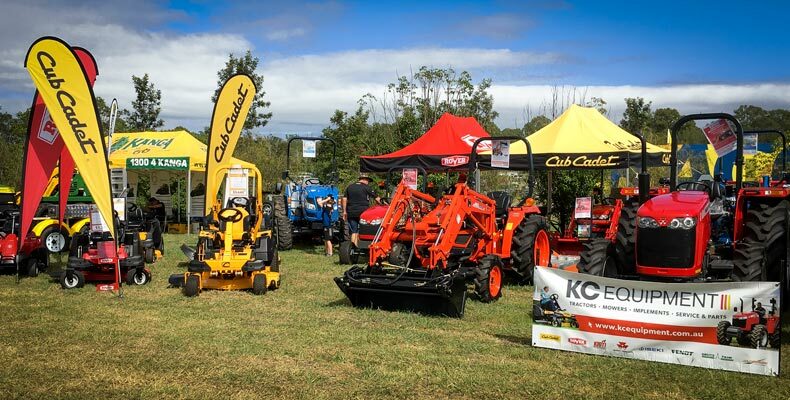 – The second annual Rotary South East QLD Expo recently took place in Jimboomba, south of Brisbane, and KC Equipment was there with a huge range of equipment for showgoers to experience. Good weather and great crowds made for a fantastic weekend, and a great result for the show’s beneficiaries, which include Heart of Australia, Life Flight, and The Jimboomba Community Hall. The show featured a range of machinery, caravans, camping and fishing gear, along with attractions and rides for the kids. On the KC Equipment stand, visitors could check out the Cub Cadet and Rover ride on and zero turn mower ranges, and climb aboard Iseki and Massey Ferguson compact and midsize tractors. Farmers and acreage owners in Jimboomba and the Scenic Rim are a huge part of KC Equipment’s business, and getting the chance to talk machinery with customers new and old always makes for a great day. You can next catch the KC Equipment team on show at PRIMEX in June, in Casino. Just like last time, we’ll be bringing a huge range of equipment for visitors to experience. See you there! KC Equipment would like to thank the Rotary Club of Jimboomba for presenting this event.